Money Talk :: - 401k and thrift savings plan ? I'm sorry, I can't address the TSP v. 401(k) contribution levels and tax deduction issues since I don't know anything about the TSP, but I did want to comment on your statement about lowering "the amount I get back from the government". If you're speaking about your tax refund, you shouldn't be getting anything back. Getting a refund after filing your income tax return means you're giving them too much up front; i.e. your withholding is too high. You're giving them your money to use for free and you haven't got the use of it until the next year. You should file a new W-4 with your employer and increase the number of exemptions so that your withholding equals the amount of your tax obligation, resulting in a refund of zero or as close as possible to zero. There's a W-4 calculator on the IRS web site, so after you find out/decide how much of your reserve pay you want to put in the TSP, you can figure out how many exemptions to claim in your W-4 such that the correct amount is withheld from your employer wages. jim2k - the rules of the two plans are nearly identical - ie, a $17,500 limit, the pre 59 1/2 age penalty, and the RMD at age 70 1/2. So your tax bill is the same for either plan (or if you split between the 2 plans). Normally you'll have more & better choices in the 401k plan (but that depends on your company) - the TSP has only 5 choices. The $17,500 is your total allowance - you can split the two anyway you like - but you can't double it. BTW, the $17,500 limit applies to the employee contribution, any employer 'match' is in addtion to $17,500. Re: 401k and thrift savings plan ? If your top tax bracket is 15%, I suggest you contribute to a ROTH IRA. The USAF pay could be used to fund a ROTH IRA up to $5,500 for you and then you could do that again for your spouse. At this time the TSP does not have a ROTH plan. Your 401k may or may not have a ROTH plan. Still the ROTH IRA is likely your best choice. I suggest you to get tax expert advice on why you are getting less tax refunds, it is possible that there may be errors in your filing process. Actually, TSP is quite flexible. As the inserted image shows, it offers 5 Individual Funds but you can create any mixture of those funds. 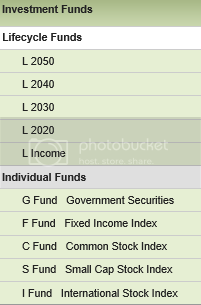 Or, you can choose one or more of the Lifecycle funds or you could have a mixture of Individual Funds and Lifecycle Funds. And, the mix can be changed anytime, with a limit on the number of changes allowed per month. The TSP does offer a Roth TSP now. Also one thing to consider is that the TSP has extremely low fees. It's something like 25 cents for every $1000 contributed. Thanks for that correction! In fact the ROTH option to the TSP has been available since May of 2012! The ROTH option for the TSP was rolled out over time during 2012 for agencies and the active military. In 2013 the ROTH Option will be/is (I can not find a schedule) for Reserve military members. To the OP: The TSP ROTH would be a good choice for you. Any matching contributions will be in a traditional account. If you are making a spousal contribution you would need to make that to a ROTH IRA. Right now the TSP and 401k administrators are waiting for the IRS folks to work out guidelines for converting to a ROTH within the respective plans. All three of you: we really need some TSP-knowledge talent here. I don't know squat about it and at my age I'm not going to take the time to learn. You're all invited to pay particularly close attention to posts in the TSP forum and share your knowledge with posters asking about TSP topics. The TSP forum was quite active at one time; perhaps it can be again if we have some regulars who know enough about it to give good answers, and have the motivation to help. You can withdraw from your TSP account at age 55 penalty free which I believe to be younger than other retirement plans? I think you have to be in your 60's with anything else? Also, you should be able to contribute to a roth ira tax free in and tax free out if you are receiving hostile fire pay. Go somewhere like UAE and max out your Roth . Every Air Force base that I've been to has a financial advisor that is going to know a lot about the TSP and other retirement plans. I would make an appointment with them. If you get into financial trouble you'll be forced to go there by your commander lol. Also, if I remember correctly, the TSP strats you out in the G fund which is gov. securities. NOT the place you wana be right now so make sure to change that. Ah ha!! Ditto invite to you, Radix! !